Over the last 5 years as an educator, I have learned a tremendous amount about student motivation and student engagement. Recently, I started reflecting on my current practices and strategies I have used to engage my students over the years. The program I am with has doubled in size from roughly 140 students to over 280, so I feel confident these strategies can, and will work. 1. Don't just care...really care! It is so easy to get wrapped up in our own little worlds, but we have got to remember that whatever is going on in our world, is 100 times simpler and less complicated than that of our students. If a student is having a bad day, or if a student is having a great day, give them the opportunity to tell you about it. Be interested and actually listen to their stories, because if you can show the students you care, they will trust you, and when they trust you, magical things can happen in an educational setting. Take an interest in their music, their hobbies, their triumphs and struggles, and use that information to help them. IF THE STUDENTS DON'T THINK YOU CARE, YOU WILL NEVER MAKE A MEANINGFUL CONNECTION WITH THEM!! 2. Speak to every student at least once every class period - the more the better! I have tried very hard to make sure this is common practice in my classroom. Even if it is a simple "hello" or "how are you doing?" it can mean a ton to the student. Additionally, making that early connection in the class period allows that student to feel more comfortable, which as we all know, students must be comfortable for learning to take place. STUDENTS DON'T LEARN WHEN THEY ARE STRESSED AND UNCOMFORTABLE!! This strategy can be really difficult, but if you can master it, it can pay huge dividends in the long run. Every year I start with new students, with different ability levels, different learning styles, and different attitudes toward education. We have got meet each student on their level. Their level means their ability, their learning style, and their attitude toward education. If we treat every student the same, we CANNOT expect the same results! Just as a doctor evaluates all of a patient's symptoms and treats the patient accordingly, we must evaluate each student and approach the learning process in a manner which is best suited for that individual student. FORGET ABOUT USING ONE STRATEGY TO TEACH ALL OF YOUR STUDENTS!! 4. Have high expectations, and expect the best from every single student every single day! I can honestly say, this has probably been my biggest strength in terms of increasing student engagement. I have found that when you push the students and they know you are pushing them, they engage themselves and respond at a much higher level than if you were giving them review work over and over. Human nature is to enjoy a challenge and a task that requires more than the minimum. 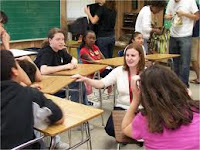 If your students are disengaged and non-attentive, perhaps they are bored, and they need a challenge to get them going. Let your students know you have high expectations for yourself, and consequently you expect the best from them too. NEVER UNDERESTIMATE THE POWER OF A CHALLENGE WHEN IT COMES TO STUDENT ENGAGEMENT!! 5. Do whatever it takes to get your students out of their desks, and give them every opportunity to use their arms and legs! Organized chaos would be how I would describe my classroom. Students need to move, and sitting for 7 hours a day is frankly torture. Would you want to sit for 7 hours a day and listen to people talk at you...no, I think not. I try to get my students up and moving at least 2 to 3 times a week. I am talking about relay races, group work, activities that require building things with their hands, an activity where unused fly swatters are used, and lastly skits and reenactments that make everybody laugh. THE HUMAN BODY WAS NOT DESIGNED TO SIT ALL DAY!! I already talked about rigor (4) and relationships (1), but I wanted to keep all three Rs together. If the students see no relevance and value in education, then how can we expect them to learn? We have got to make sure what they are doing in school is practical and relevant, because if we don't we have no shot at engaging them. In my classroom I have shown them the connections to what we are learning and the world in which they live. Also, I have used resources to make what they are learning applicable in their current lives, and have shown them ways to use what we have learned in class. IF THEY SEE NO VALUE, THEY WILL NEVER BE TRULY ENGAGED!! 7. Most importantly...give your students a voice and involve them in the educational process! Unfortunately, this is one of the most difficult things to do in an educational setting, and because it is one of the most difficult, it is one of the most important. The students know how they learn, they know what they like and dislike, and they hold the key to getting them interested and engaged. Every day I see 140 students, and my goal is to use them to help me do my job more effectively and efficiently. Students are a free resource that most educators ignore. Include them in making assignments, teaching lessons, designing rubrics and writing quizzes and tests. What do you have to lose? They will provide you with a wealth of knowledge, and most importantly, they will be engaged because they are a part of the process. They now have a voice in how they are educated, as well as how they are assessed...STUDENT INVOLVEMENT = AWESOME!! Please respond with any additional strategies you have used to engage your students. I would love to add to my list and compile a much larger list to use for new teachers, as well as teacher growth and development programs. Thank you in advance for your help! You nailed it with your seven tips to engaging students. I started teaching in the HS arena after teaching kindergarten for 13 years. People thought I was crazy and that the HS environment would not fit with my teaching style. My main number one strategy is that students can tell when you care and if they know you do you can always work with them. Students know instantly when teachers or administrators don't give a crap and that is where the non-learning and behavior problems begin. Every other teaching technique and strategy builds on this main point. I really like number five with the get them moving concept. As an art teacher that was my goal to get them moving around the room. Teenagers are growing as much as teh elementary kids and they do not get recess. They Should!!! We know what research says and yet we do not use the proven research in scheduling HS schedules. Teenagers need healthy snacks, they need movement and exercise, and they need rest. How does the schedule provide for these needs? 7 is key to relationship building. I let the students know about decisions being made at faculty meetings. I let them be involved in the process of what is being taught. I am willing to change my lesson plans for and idea that is new or even better, and yest students do have better ideas at times. I will add a number 8 to your llst. Be firm when firmness is needed. Students want limits when they are warranted. When the limit has been reached they may say that it is unfair but they are just testing to see if you mean it. I have had students that have been very disruptive and push limits often who when they are seniors say they understood why I held the line and did not let the behavior go. Students respect the caring in setting limits. I am now starting my first year as a School Administrative Manager and am organizing an At Risk Alternative School. Your 7 tips are refreshing for this part of the year. Great post very correct. Refreshing at this point in the school year and all through the year. Your number one strategy is number one. I use the anology that dogs and horses can tell if you like them and behave accordingly, students can smell a member of the staff that does not care about them a mile away. Behavior and engagement issues soon arise when students know a teacher is not interested in them. This idea also goes for teachers who know administration does not care or even parents who can tell that staff does not care. Relationship building is key to the educational process but also life. This year I am beginning a position as a School Administrative Manager. I will be working with the Alternative School and also with the Early Childhood center . I will have a challenge to build relationships with the staff, parents, and children . Being around the individuals in the programs without teaching them directly in the classroom will be different. It will be interesting and hope that it shows how much I do care with this new position. I'm going to say this again... you need to write a book. Someone's going to steal all your ideas and do it if you don't! You could honestly just publish what's on here. Great post, Justin. I think the strategies that you list will provide some comfort to those who have linked student engagement to "edutainment." Nowhere do you mention the latest in technology, iPads, social media apps, and the like. Engagement hinges on relationships, rigor, and relevance. Thanks for the reminder.